The DaffSeek query menu items labeled “Division”, “Perianth Colors (petals)” and “Corona Colors (cup)” refer to a system of daffodil classification. These number and letter combinations are the standard way of describing and classifying daffodils and are the same as you would see in many daffodil catalogs. The daffodil color coding system was devised by Dr. Tom Throckmorton of Iowa, United States. In 1975, the Royal Horticultural Society (RHS) of the United Kingdom adopted Throckmorton's color code system as part of their official system for daffodil classification. DaffSeek follows the RHS daffodil classification system. 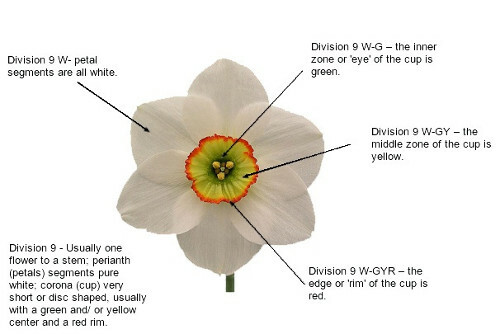 The Division and Color Codes of an individual daffodil is part of its official registration with the RHS. The classification of an individual daffodil is based on the hybridizer's choices when he or she registers the daffodil. If the flower grows with a red cup in Australia where a hybridizer lives his or her flower will be registered with a red cup. However, it may grow differently in your region, for example with an orange cup. The Throckmorton classification system describes the colors of a daffodil from one to three zones for each perianth (petals) and corona (cup). Daffodils are are given a color code to describe both the perianth (petal) color and the corona (cup) color. When looking at a 'daffodil code', the first number is the division. The letter or set of (up to three) letters that follows the number, represents the perianth (petal) color. The petal color is described by beginning at the outside edge of the petal, then the middle, and lastly the inside part next to the cup. The second letter or group of letters represents the color of the corona (trumpet or cup) starting from the inner-zone or "eye", then the mid-zone and lastly the outer edge or rim. Some colors do not develop until the daffodil has matured in your garden. For example, daffodils with Pink cups sometimes open with a yellow cup but the pink emerges after a few days. There are also regional variations in colors as well as variations based on our variable spring weather from year to year.